Changing magnetic fields are a source of electric fields. Faraday's law states that the emf induced in a loop is equal to the rate of CHANGE of the magnetic flux through the area enclosed by the loop. The equation below expresses Faraday's law in mathematical form. In this lab you will use a simulation to explore consequences of Faraday's law, and another simulation to explore the inductance of circuit elements. Use an on-line simulation from the University of Colorado PhET group to explore the Faraday's law. Click on the "Pickup Coil" tab. What happens when a magnet moves through a coil in which a current can flow? as you change the polarity of the magnet? Record your observations for each type of change. In a transformer, a current in one coil creates a magnetic field. When the flux of this magnetic field through the second coil changes, an induced current flows in the second coil. With a direct current (DC) flowing in the primary coil and the voltmeter connected to the secondary coil, move the primary coil in and out of the secondary coil. Record your observations. With an alternating current (AC) flowing in the primary coil and the voltmeter connected to the secondary coil, move the primary coil inside the secondary coil. For the primary coil move both the voltage and frequency sliders to 100%. Record the maximum reading of the voltmeter as you change the number of turns of the primary coil, the number of turns on the secondary coil, and the loop area of the secondary coil. Always only change one variable while holding the others fixed. Discuss your results. In a generator, an external force moves a magnet in a magnetic field. The external force does work and this work is converted into electrical energy. This simulation provides a simple model for the generators in a hydroelectric plant. Record the maximum reading of the voltmeter as you change rpm of the magnet, the number of turns of the coil, and the loop area. Discuss your results. Imagine you were actually turning the magnet by hand to generate a current. Neglecting friction, would you have to do work to keep the wheel turning? Use an on-line simulation from the University of Colorado PhET group to explore the inductance of circuit elements. Components are dragged from the toolbox to make circuits which can be monitored using meters and charts. To explore the properties of a component, right-click it. You can then change many properties and also remove the component. Use a 50 V battery in series with a switch, connected to a 10 Ω resistor R1 and a light bulb with resistance R2 = 100 Ω in parallel. Use a current chart to monitor the current through the bulb and a voltage chart to monitor the voltage across the switch. Before you close the switch, predict the voltage across the switch and the current through the bulb. Record your prediction. After you close the switch, predict the voltage across the switch and the current through the bulb. Record your prediction. Does the animation support your predictions? Adjust the scales on the chart recorders appropriately. Flip the switch a few times. How long does it take for the current through the bulb and the voltage across the switch to change after you flip the switch? The circuit you have constructed could be a model for a low resistance device, such as the coil of an electric motor, in parallel with a high resistance device, such as an indicator light. But a coil has self-inductance. For a better model, place a 50 H inductor in series with the resistor R1. Describe what happens to the voltage across the switch and the current through the bulb when you close the switch. Describe what happens to the voltage across the switch and the current through the bulb when you open the switch. Because the coil of a motor has a self inductance L, an emf proportional to the rate of change of the current in the coil is induced. When you flip the switch, the rate of change is very high, and the induced emf can be several times the power supply voltage. Do you observe such an induced emf? A spark across the switch can be prevented, by connecting a diode in parallel with the inductor. A diode is an electronic component that lets current flow through it in only one direction. It has near zero resistance when "forward biased", and very high resistance when "reverse biased". 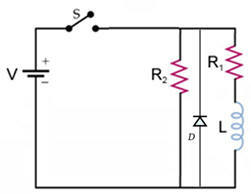 When the switch is closed, the diode is reverse biased and affects the circuit minimally. When the switch is opened, the diode become forward biased and current flows through the near-zero resistance diode instead of arcing across the switch. Unfortunately the simulation does not let us put a diode into the circuit.